Members of the University of Maine women's basketball team practice at Memorial Gym in Orono Tuesday. The UMaine women's and men's teams will be playing 11 games at Memorial Gym this season. ORONO — The University of Maine is moving closer to procuring the estimated $14 million needed to begin the proposed renovation of the Memorial Gymnasium and field house athletic complex. Even so, the athletic department isn’t waiting until the money is in the bank and the upgrades have been completed to begin utilizing the facility more regularly. UMaine athletic director Steve Abbott said the Black Bears’ basketball teams will play 10 home games inside Memorial Gym, affectionately known as “The Pit,” during the 2011-12 season. The UMaine men have scheduled seven games at Memorial Gym, including regular-season contests against Division III UMaine-Machias (Nov. 14), Utah Valley (19), Eastern Illinois (Dec. 21), Hartford (Jan. 19, 2012), Stony Brook (Jan. 21, 2012) and Vermont (Feb. 6, 2012). The women’s games in “The Pit” will include Bryant (Nov. 19), Division III Maine Maritime Academy of Castine (Nov. 29), James Madison (Dec. 8) and America East rival New Hampshire (Jan. 25, 2012). The remaining men’s and women’s home games will be played at Alfond Arena, UMaine’s basketball home since January 1992. The men’s team has held a total of eight games at Memorial Gym since 2003-04. Abbott said the decision to use “The Pit” was made after discussions with veteran UMaine men’s coach Ted Woodward and first-year women’s coach Richard Barron. Toward that end, UMaine is performing some preliminary upgrades to make sure the gym provides a good experience for players, coaches, fans and staff alike. Abbott said navy blue paint already has been applied to the floor around the perimeter of the court, in the jump circle and in the lanes to help better define the basketball lines.There are numerous other lines painted on the floor, including those previously used for volleyball. “We’re going to have new backboards for the game court and we’re going to repair the side hoops so they’ll go up and down,” said Abbott, who mentioned those obstructed some fans’ view last season when the UMaine men beat Norfolk State 74-54 there on Dec. 12. New scoreboards and shot clocks also will be installed. Abbott said the upgrades are expected to cost $100,000, but UMaine will be able to use some of the equipment even after the renovation project is completed. Barron threw his support behind playing games in Memorial Gym because of the potential benefits, both in the short and long term. Woodward, whom Abbott jokingly called “Mr. Pit,” has advocated playing games in Memorial Gym because it provides the players with more of a home-court advantage, since they practice in the facility. Woodward could not be reached for comment Tuesday. Among concerns about using “The Pit” is the potential for not being able to accommodate more than the estimated capacity crowd of 1,300. Abbott explained the games to be played in Memorial Gym will be either nonleague contests or weekday conference games, which tend to draw smaller crowds. The UMaine men averaged 1,480 fans (tickets issued) for its 15 home games last season, while the women attracted 1,259 fans over the course of 13 home contests. UMaine also cannot offer access to the second floor of the building other than via the stairs. However, Barron said UMaine is planning to utilize some portable seating on the floor level to accommodate folks who aren’t physically able to climb stairs. Abbott admitted there could be some other logistical issues that could make staging the games more difficult on the athletic events staff. “We’re excited about it, but there’s some challenges associated with doing it,” he said, mentioning things like 76-year-old wiring. In addition to what is expected to be a cozier, louder, more intense atmosphere, playing in “The Pit” frees up Alfond Arena for use by UMaine’s varsity hockey teams or local organizations that might want to rent the ice. Abbott said it costs between $2,000 and $3,000 to put down the basketball court on the ice surface and then take it back up for games at Alfond Arena. UMaine played home basketball games at Memorial Gym from its opening in 1935, but held some games at the Bangor Auditorium from 1980 through the early part of the 1990-91 season. 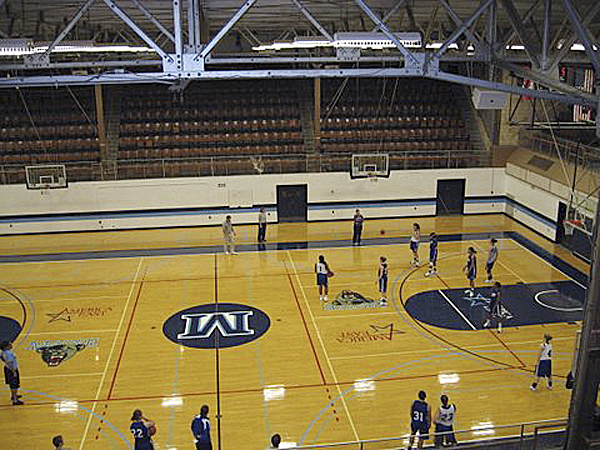 Once the funding for the proposed project is in place, UMaine will begin retrofitting the building to make it the full-time home of Black Bear basketball. Correction: The Oct. 30 men’s exhibition game against Fisher (noon) is not among those and will be played in Alfond Arena. That contest is part of a doubleheader, including a 2 p.m. women’s exhibition against the University of New Brunswick.